Copts have lived in Adelaide for well over three decades. In the beginning, lacking a permanent church building, these Copts were served by visiting priests. The priests Fr. Tadros Malaty, Fr. Mina Mikhail, and the late Fr. Victor Rofael would visit the Coptic Community in Adelaide, where services were held in rented halls or churches. Then in November 1982, the community found the means to buy a church and land that is currently St. Mary and Anba Bishoy Coptic Orthodox Church, in Cowandilla. The first liturgy was celebrated by His Grace Bishop Antonios Markos in January 1983. The parish was served by different priests including Fr. Mina Discoros, Fr. Hippolytus El Soriany and Fr. Daniel El Antoni (currently His Grace Bishop Daniel of St. Shenouda Monastery, Sydney). In January 1993, Fr. Philippos Boghdadi began his service amongst the Adelaide Coptic Community and has been serving there ever since. This year Dr. Nader Sidaros was nominated for ordination to the Priesthood, serving the parish of St. Mary and Anba Bishoy Coptic Orthodox Church. Since his enthronement over the Diocese of Melbourne and its Affiliated Regions, His Grace Bishop Suriel has always shown much support for his children at St Mary and Anba Bishoy’s Church. In every project and development which was undertaken, his word to us was “not Yes and No, but in Him was Yes. For all the promises of God in Him are Yes, and in Him Amen, to the glory of God through us” (2 Cor 1), and it is through His love and prayers for us that the Church is as it is to this day. The church currently has four altars. Three are within the church named after St Mary, Anba Bishoy and St Demiana.The fourth is located outdoors to the South-East of the church and is named after Archangel Michael. May the Lord continue the mercy He has shown to the Coptic Community in Adelaide.Amen. 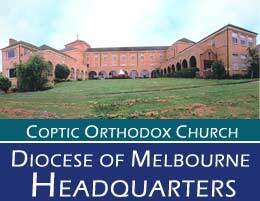 The Coptic Orthodox Church Diocese of Melbourne and Affiliated Regions was established with the ordination of His Grace Bishop Suriel on 4th December 1999. This Diocese covers Victoria, SouthAustralia, Western Australia, Australian Capital Territory, Tasmania and New Zealand. It is the largest Coptic Diocese in terms of geography and its community has been growing quickly in last few decades.